Brown. My real hair color. Yes, really. Brown. Everybody’s skin to some degree. Brown. Almost purple. Sometimes green. One-third of the camouflage cow. The roadmaps on our palms. Oil spill in the Gulf. Waterlogged sand between my toes. Brown grease for the fish fry. and a whole pool circling around mine. Staring at my future ex-husband. Brown. My fertilized and matured ovum. The brown half-moons above my babies’ fingernails. Daddy’s brown belt versus Mama’s brown switch. Even the way we “act” is brown. in the middle of the street in the ‘hood. 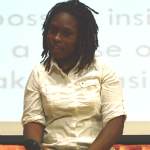 Ashanti Anderson is an undergraduate student at Xavier University of Louisiana in New Orleans.